POLEFDN is a spreadsheet program written in MS-Excel for the purpose of analysis of a pole foundation assuming the use of a rigid round pier which is assumed free (unrestrained) at the top and subjected to lateral and vertical loads. Specifically, the required embedment depth, the maximum moment and shear, the plain concrete stresses, and the soil bearing pressures are calculated. 1. 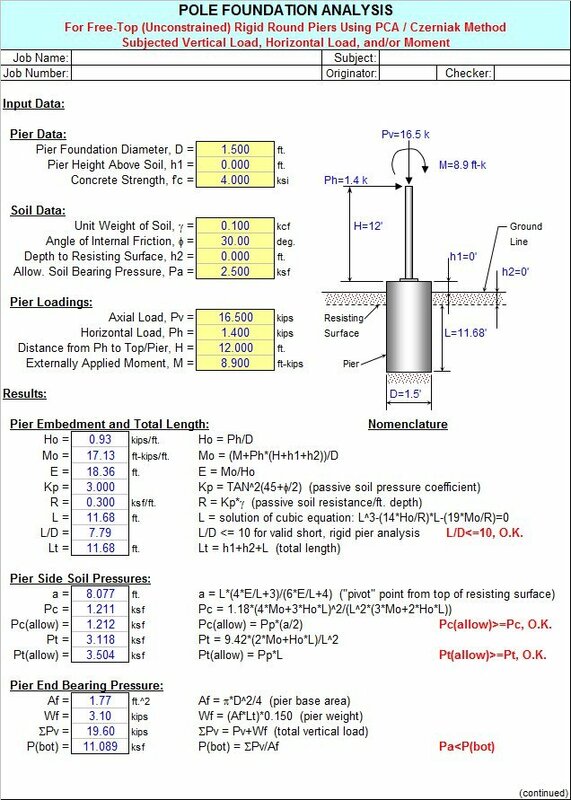 Since there is not a universally accepted method for pole foundation analysis, this program offers up five different methods of determining embedment length for pole foundations. The "Pole Fdn(Czerniak)" worksheet is the primary method emphasized in this program, since it provides the most detail in overall analysis. However, it does yield the most conservative embedment depth results of all the methods presented. 3. The "Pole Fdn(Czerniak)" worksheet assumes that the foundation is short, rigid, meeting the criteria that the foundation embedment length divided by the foundation diameter <= 10. 4. This program will handle both horizontally as well as vertically applied loads. The vertical load may have an associated eccentricity which results in an additional overturning moment which is always assumed to add directly to the overturning moment produced by the horizontal load. 5. This program assumes that the top of the pier is at or above the top of the ground surface level. 6. This program assumes that the actual resisting surface is at or below the ground surface level. This accounts for any weak soil or any soil which may be removed at the top. 7. The "Pole Fdn(Czerniak)" worksheet assumes that the rigid pier rotates about a point located at a distance, 'a', below the resisting the surface. The maximum shear in pier is assumed to be at that 'a' distance, while the maximum moment in the pier is assume to be at a distance = 'a/2'. 8. The "Pole Fdn(Czerniak)" worksheet calculates the "plain" (unreinforced) concrete stresses, compression, tension, and shear in the pier. The respective allowable stresses are also determined based on the strength (f'c) of the concrete. This is done to determine if steel reinforcing is actually required. However, whether minimum reinforcing is to be used or not is left up to the user. The allowable tension stress in "plain" concrete is assumed to be equal to 10% of the value of the allowable compressive stress. 9. 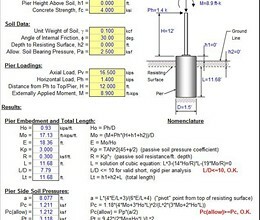 The "Pole Fdn(Czerniak)" worksheet calculates the actual soil bearing pressures along the side of the pier at distances equal to 'a/2' and 'L'. The respective allowable passive pressures at those locations are determined for comparison. However, it is left up to the user to determine the adequacy. 10. Since all overturning loads are resisted by the passive pressure against the embedment of the pier, this program assumes that the pier acts in direct end bearing to resist only the vertical loading. The bottom of pier bearing pressure is calculated, which includes the self-weight of the pier, assumed at 0.150 kcf for the concrete. * POLEFDN download link provides freeware version of the software. POLEFDN has been rated 4.4 out of 5 points. A total of 7 votes cast and 0 users reviewed the software.